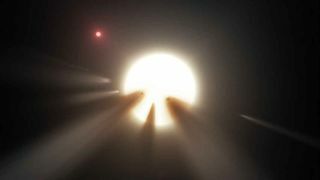 This artist's illustration shows comet fragments crossing the face of a star, one possible explanation for the strange dimming exhibited by "Boyajian's star." SAN FRANCISCO — Astronomers may have to think a little harder to solve the mystery of Boyajian's star. In September 2015, Yale University's Tabetha Boyajian and her colleagues reported that the star KIC 8462852 has dimmed dramatically multiple times over the past seven years, once by an astounding 22 percent. Researchers have come up with many possible causes for the dimming, including a swarm of broken-apart comet fragments, variability in the activity of the star itself, a cloud of some sort in the interstellar medium between Kepler and Boyajian's star, and, most famously, an orbiting "megastructure" built by an alien civilization to collect stellar energy. Researchers are testing these hypotheses to the extent possible. For example, the $100 million Breakthrough Listen initiative is using the Green Bank Telescope in West Virginia to hunt for signals coming from Boyajian's star, which lies about 1,500 light-years from Earth. Wright has spent a fair bit of time over the past 15 months pondering what's happening with Boyajian's star; indeed, he's lead author of a recent study outlining the various possiblities. The mystery has only deepened since Boyajian and colleagues' September 2015 paper. Early last year, for example, astronomer Bradley Schaefer of Louisiana State University determined that, in addition to the periodic brightness dips, the star dimmed overall by about 20 percent between 1890 and 1989. This result was bolstered by another 2016 study, which found that Boyajian's star dimmed by about 3 percent between 2009 and 2013. Wright has said that the interstellar-cloud explanation seems the most likely of the proffered hypotheses. But he's not betting on it. "That would have to be some crazy interstellar cloud," he told Space.com here last week at the annual fall meeting of the American Geophysical Union. Researchers may have to dig deeper to figure out exactly what's causing the strange dimming of Boyajian's star, Wright said. "I think it's very likely that we haven't heard the right answer yet — that I haven't heard the right answer yet, anyway," he said.